When you gather three generations of Jewish women and have them rank their favorite traditional foods, you inevitably get five opinions. Even if there are only four people in the room. 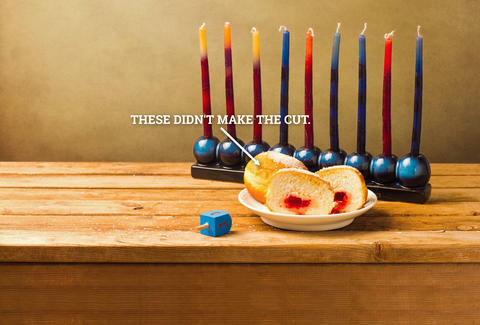 Ah, Jewish humor! This ranking only scratches the surface of dishes associated with Jewish cuisine -- there's plenty more out there from Europe and Israel. And keep in mind that this ranking is only four women’s opinions (me, my sister, my Mom, and my Bubbe). But we know our stuff. Disagree? Go kvetch in the comments. Bubbe: "I remember how Bubbe Rosie used to do it. 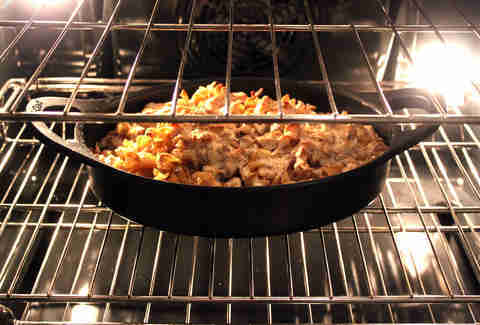 The first one never came out right because the pan wasn't quite hot enough." Latkes are potato pancakes, fried in oil and eaten during Hanukkah. Yeah, fried potato; can’t mess that up, right? This dish, however, is where our family has some strong and disparate feelings. My Bubbe prefers a finer grate on the potato, and always adds an onion. My Mom, on the other hand, prefers a larger grate, and no onion. (My sister and I are on #TeamMom.) 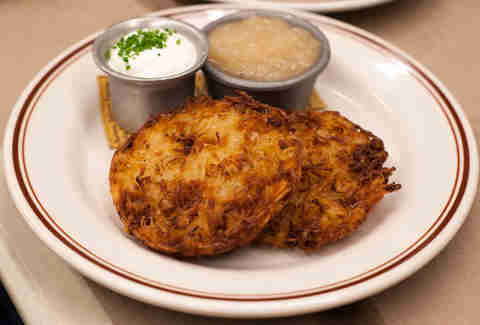 Latkes are traditionally eaten with applesauce and sour cream. And if you are the one in charge of frying them, you’ll smell like fried potato for a week. Mom: "When I was growing up we would have this 'Cousins Club' Hanukkah party every year. It was when you would see all the cousins you didn't necessarily want to see. And they would make these latkes. And those latkes were mushy." The best way to describe noodle kugel is a sweet bread pudding made with egg noodles instead of bread. 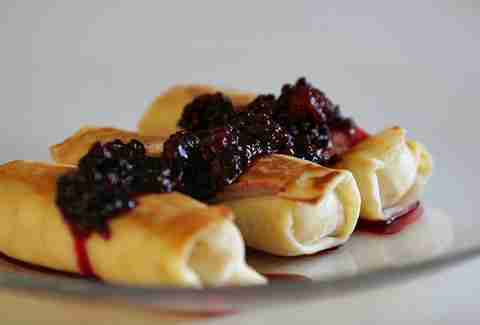 It is traditionally eaten on Yom Kippur during the evening meal where Jews break their daylong fast. There are many varieties of kugel, but the four of us agree, if it isn’t topped with cinnamon, brown sugar, corn flakes, and butter, there is no point in eating it. Mom: "I've had some pretty crappy kugels." Sister: "I have to say, I got a pretty good kugel at Attman’s Deli in Baltimore." Mom: "Shout-out to Attman's in Baltimore!" Sister: "Where's gefilte fish on the list?" Mom: "It's not on the list." 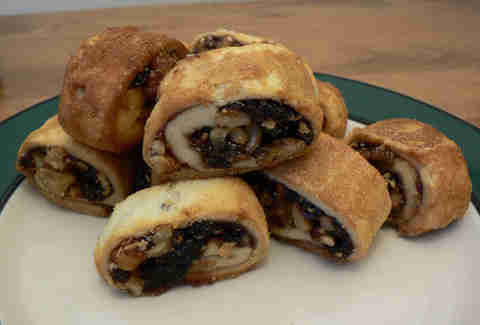 Rugelach is basically pastry dough with treats -- jam, nuts, chocolate -- rolled into it. It's part cookie, part croissant. The filling and crescent-roll shape are what make it unique. If you're going to purchase rugelach, avoid anything that is in a plastic tub, and looks like a Fig Newton. Sister: "If you go to a place like Canter's, and you go to their Jewish bakery -- on the whole they have pretty excellent stuff. Their hamentashen are incredible; their butter cookies are out of this world. Their rugelach is horrendous." Sister: "And that's where people are told to go when they go to LA! They're like, 'Oh, you should go to Canter's, and get the rugelach'. And it is such crap. No offense Canter's, I love you." 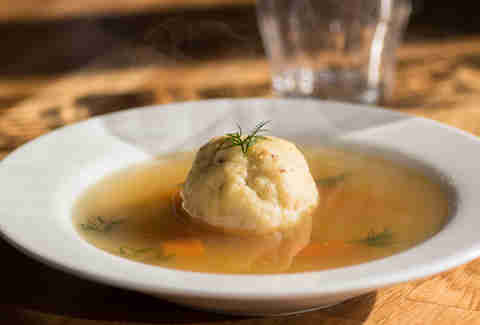 While matzo ball soup is traditionally eaten during Passover, in my family we eat it at nearly every Jewish holiday -- and many times in between. Matzo balls are akin to dumplings, and are made from matzo meal and eggs. Sister: "Don't give away the family recipe, Bubbe!" Bubbe: "Why not? It's delicious!" Bubbe: "It has to be a kosher chicken." For the record, Sarah Gray has plucked feathers out of a kosher chicken, and does not wish the task on anyone. Follow her at @sarahhhgray.